A pressed panic button and a life-sized Call of Duty statue led to LAPD entering the offices of developer Robotoki with guns drawn. Of all of life's temptations there is probably none greater than a button. It doesn't matter what warnings you're given or the size and variety of "Do Not Push" signs you hang above it, the presence of a button will inevitability to lead to someone pushing it. In some cases the consequences are minor. Some button pushes, however, can lead to your building being swarmed by armed police officers. Such was the case last night at the offices of Robotoki, an independent game studio based in Los Angeles. "Our studio is equipped with a 'panic' alarm in case of an armed threat, which was installed yesterday," said Robotoki founder and former Call of Duty spokesman Robert Bowling. "One of our designers, who shall not be shamed, pressed it on his way out because apparently when boys find buttons that they are unsure of, their first instinct is to push it." The button press alerted local police who sent officers to respond. When the officers reached the Robokoti office, they saw what they believed to be an armed assailant through a window on the rear side of the building. 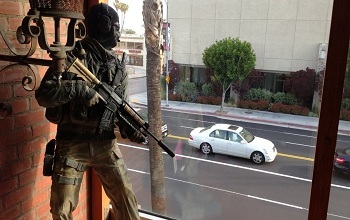 The armed man was actually a life-sized statue of the Call of Duty: Modern Warfare's character Simon "Ghost" Riley. Believing they'd walked into an actual situation the officers entered the building. "I was in my office when they arrived and saw them coming up our stairs, guns drawn," Bowling said. "They yelled for me to put my hands up and walk towards them slowly, then took me into custody and out of the studio until they cleared the rest of the rooms and floors." After searching the building and coming face to face with the "suspect" the officers returned to Bowling laughing over the misunderstanding. Passing the situation off as a prank gone awry, the police opted not to fine Bowling. It wasn't until later that Bowling and Robotoki would realize the button press had been an inside job. "We reviewed the security footage and saw our designer's curiosity to be the cause."